So, this heralded breakthrough does not seem to be much of a breakthrough at all. It probably has the same status in Rome as Evangelicals and Catholics Together: none. It brings up the larger question, “why bother trying to do business with the Roman Catholic Church, in any event. But further to that, if these [Reformed] folks did get a chance to negotiate with anyone significant in Rome, it’s pretty clear that they’d end up with the bitter taste of dust in their mouths. 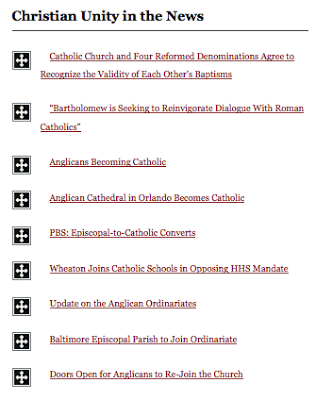 In recent years, there have been a number of these “from-the-ground-up” types of agreements, such as the ECT series, the “Joint Declaration” with [some] Lutherans on Justification, and so on. While some of these “breakthroughs” get reported, the real substance is that, negotiation with Rome will get you nowhere. In June the Lutheran World Federation (LWF) formally approved a “Joint Declaration” (JD) on the doctrine of justification that had been worked out over many years of theological dialogue with the Catholic Church. Shortly after that, Rome made its official response in a joint statement issued by the Congregation for the Doctrine of the Faith (CDF) and the Pontifical Council for the Promotion of Christian Unity (CCU). These developments received considerable play in the general media with stories about an “historic agreement” on the chief doctrine that had separated Lutherans and Catholics for almost five hundred years. The reality is somewhat more complicated than that. Rome did officially “receive” JD in the sense that it affirmed that very significant progress had been made in removing past misunderstandings, and in moving toward full agreement on what it means to say that the sinner is justified by faith. However, many of the Catholics and Lutherans involved in producing JD are saying—mainly off the record, for the present—that the Roman response is, in the most important respects, a rejection of the declaration. JD proposed that, with the new understandings achieved by the dialogue, the mutual condemnations of the sixteenth century no longer apply, and remaining differences over the doctrine of justification are not church-dividing. The Roman statement does not accept that proposal. It would be an understatement to say that the theologians involved in the dialogue, both Lutheran and Catholic, were taken aback by the Roman response. During the process, Rome had indicated problems with aspects of the declaration and, almost up to the last minute, revisions were made to take those concerns into account. The participants in the dialogue thought they had been assured that JD would be approved by Rome. Certainly that was the understanding that informed the LWF's approval of the declaration. In the immediate aftermath of the statement by CDF and CCU, the mood among dialogue participants was bitter and despondent. One Lutheran pioneer of the dialogue declared that the theologians, both Lutheran and Catholic, had been “betrayed” by Rome. For decades to come, he predicted, it would be impossible to reestablish confidence in any theological dialogue with the Catholic Church. I’ve bolded key sections from Neuhaus. Rome will smile and nod, and smile and nod, and just when you think that some agreement has been reached, they say “no, it’s our way or the highway”, and you get to experience the bitterness of “buyer’s remorse”. "What this means for the average small [Anglican] parish thinking of accepting the offer is that the entire parish will no longer have autonomy. *[you] will begin Roman catechism for 2 years, [your] clergy will step down and become laymen and will have to complete their education if lacking before being able to serve anyone; your buildings, if any, will need to be disposed of. *you will be directed to a local RC Diocese since ours are far flung and overlapping many RC dioceses in between. *you will likely be directed to a local RC parish (100 families is the minimum standard for a RC parish) for worship in the early am. * you will be somewhat segregated from the RC congregation. *your children will learn Roman Catholicism, you will die, the Roman Church will go on as before and that will be the end of that…. Let us be clear. Unlike the "uniates" and "rites," former Anglicans will not have their own church within the Church. They will be absorbed, but with permission to use something different, but as of yet undefined. 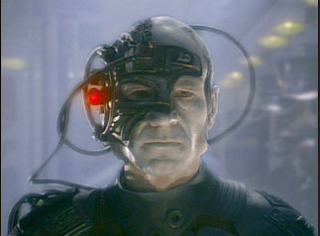 Rome=”The Borg”. Lots of folks don’t yet know this, however. Rome will smile and nod, and smile and nod, and just when you think that some agreement has been reached, they say “no, it’s our way or the highway”, and you get to experience the bitterness of “buyer’s remorse”. So it seems that the Roman church is uncompromising. What else would one expect? Why do we need "dialogue?" Why do we need to keep having dialogue after dialogue after discussion after discussion to try to convince ourselves that the gulf between Rome and Protestants is a mere misunderstanding? Is the Tiber merely a semantic issue? It seems to me like repeated efforts at "dialogue" are assuming this. That is my humble opinion, admitting that I have had very little exposure to Rome or its apologists. Would that Protestants quit seeking "dialogue" with error and just, for once, stand uncompromisingly for truth. Since truth and love go together, make sure that your comments arise from a genuine love for the persons about whom (or to whom) you are speaking. It is a good habit to pray for the person you are writing to (or about) both before and after you write your comment. Pray that you will be united with this person in the Body of Christ. If you are criticizing another participant’s claim or position, address your criticism to that person in the second-person; don’t speak about that person in the third-person. Speaking about another participant as though that person is not present is impolite, and suggests that you wish only to criticize a person, and not to be reconciled with that person in the truth. This is to be a forum wherein unity is pursued in the context of humility, charity, respect and prayer. For that reason, ad hominems are not allowed. That means that you may not criticize or insult or belittle or judge or mock any person, his character, intelligence, education, background, or motivations. Attacking persons is fallacious and uncharitable and will not be permitted here. I'm with you -- I'm all for seeing Protestants stand uncompromisingly for Biblical Truth. However, there are quite a few Protestants these days who are buying the story that these Called to Communion folks are putting out. So we just have to keep plugging away. I've spent a little bit of time looking over CtC articles. I'm new to this portion of the blogosphere, being introduced to it when I heard about that ex-Reformed minister who wrote "I fought the church and the church won" (I forget his name right now). I can have dialogue with folks who disagree with me, but it seems based on what you quoted from CtC and what I have read, that many times people are using the word "unity" solely for its emotive value. After all, who doesn't want unity?!! What seems to me to be often meant by the term "unity" is more accurately put as "coming to an RC understanding of the faith," because if everyone is being wholly honest, Rome isn't budging one bit for "unity" with Protestants. Thanks for your site. It is helping me greatly in my walk and in learning. Thanks Justin. The individual you are talking about is Jason Stellman. And I would nuance what you said about "unity" - yes, they do use the word for emotional purposes, but they also intend to male converts out of all of us. That is their view of "unity".